An aspirational guide to incorporating the transformative power of crystals and gemstones into a stylish life, from the founder of luxury crystal-infused skincare line Sjal. There are many reference books on crystals on the market, but there is no book like Elemental Energy, which guides readers through incorporating the beauty, allure, and power of crystals into a stylish life. With its elegant aesthetic and lush, fashion-forward photography, Elemental Energy is an entirely new take on crystals-one that captures their magic and magnetism, but for a decidedly modern twenty-first century life, from organic skin care to at home spa treatments. 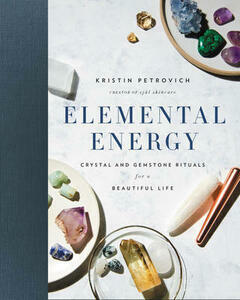 Part aspirational, part prescriptive, Elemental Energy combines full-color photography throughout with innovative practices, tips, and techniques for harnessing the transformative energy of crystals and gemstones for optimal wellness and beauty. Author Kristin Petrovich-founder of luxury gem-infused skincare line Sjal-takes readers from the basics of crystal and gemstone energy to building an affordable, essential crystal collection; from crafting crystal-infused skincare to self-care with crystal and gemstone massage; from creating luxurious and restorative crystal-centric rituals to finding the perfect stone to enhance every occasion. Timely and on-trend, Elemental Energy is the must have resource to a beautiful life infused with the energy of crystals and gemstones, from an unparalleled expert in the holistic, luxury beauty world-perfect for crystal obsessives and fashion savvy readers alike.